The Dodgers thankfully decided to not relive the memory of getting swept by the Marlins at home like last year — when everybody declared the Dodgers had made a huge mistake about everything and were doomed, but I digress — and came away with a 7-2 victory. Of course, nothing good can happen to the Dodgers without something bad, and Justin Turner‘s injury sullied the whole mood. Hyun-Jin Ryu was throwing batting practice early in the game, with everything with contact being absolutely killed. It looked like a potential disaster in the making, but Ryu settled down a bit as the game wore on. He made it through 5.1 innings, somehow only allowing two runs on solo shots by Justin Bour and Christian Yelich. Unfortunately, he did exit with an injury of sorts, but limited the damage over seven hits and a walk while striking out three. Ryu did his job by keeping the Dodgers in the game, but it seems like he might be due for a disabled list stint as this just gives the Dodgers an excuse. We’ll see. Comebacker only "grazed" Ryu's leg. Not a high level of concern, Dave Roberts said. Fortunately, Ryu was backed by a quality offensive performance. The Dodgers got off to a quick start offensively with three consecutive singles from Chase Utley, Corey Seager, and Turner to load the bases. Cody Bellinger then hit a sharp grounder to first that required a diving play to rob him of a hit, but that still plated a run at least. Hot hitting Yasmani Grandal was next, but he rolled over one and the Marlins were out of a jam. In the second, Joc Pederson started things off with a single and Yasiel Puig drilled a 94 mph fastball over the wall in left center. Utley then singled home Ryu, who doubled (!!!) into the gap, to bring home another run. Adrian Gonzalez was welcomed back in the third with a single to right that drove in JT, who reached on a walk and advanced to second on a stolen base (wtf). The Dodgers added insurance in the eighth, with Joc and Puig drawing back-to-back one-out walks. That was followed by Jansen of all people getting an infield single to load the bases. 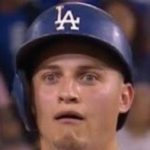 Utley then hit a sacrifice fly to left for a run, and after Seager walked to load the bases again, Chris Taylor also drew a walk to force another run home. On the night, the Dodgers drew a whopping nine walks and had 11 hits to drive them in and have the damage done. Chris Hatcher took over for Ryu and got back-to-back strikeouts to escape trouble. Luis Avilan then followed with a 1-2-3 frame in the seventh. Avilan also started the eighth giving up a lead-off walk, which led to Josh Fields entering. Fields promptly walked another before retiring the next two without any damage. That brought in Kenley Jansen to get the four-out save, and he got out of the eighth with a strikeout. The ninth was particularly impressive, as Jansen struck out the side on nine pitches to notch himself an immaculate inning to end things. This … might be good? Of course, everything is muted because of JT pulling up in the seventh after trying to score on a Grandal single. It looked like a bad hamstring injury, and we just have to hope for the best at this point. 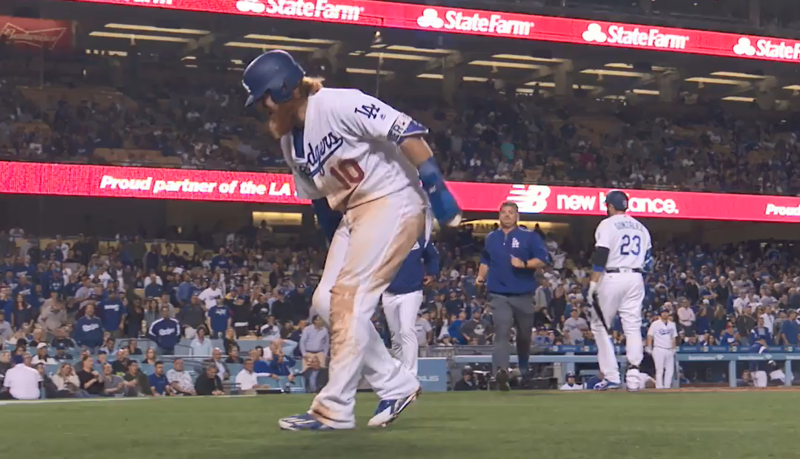 #Dodgers 3B Justin Turner will have MRI test Friday. Right hamstring injury. Dave Roberts said he is "holding out hope" of no DL. The Dodgers improve to 24-18 overall with the win, and an impressive 14-6 at home. Marlins come in for another with the Dodgers tomorrow at 4:10 PM HST/7:10 PM PST/10:10 PM EST. Alex Wood (2.27 ERA/1.70 FIP/2.11 DRA), who is pitching like an ace, will be on the mound for the Dodgers, squaring off against Justin Nicolino (1.50 ERA/3.94 FIP/3.33 DRA), making just his second start of the year.